The next time you set out to make a fruit cobbler, don’t limit yourself to one type of fruit. Mixing and matching fruits can make for a cobbler that is even more delicious than usual because you get multiple flavors each time you take a bite. 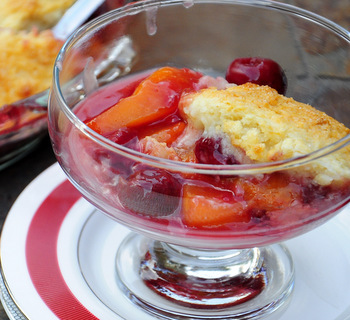 I often bake both cherry cobblers and peach cobbers during the summer when these fruits are super sweet and at their peak, but combining them into this Cherry and Peach Cobbler made this simple dessert a standout. I used sliced, ripe peaches and fresh black cherries in the filling, as well as brown sugar and vanilla extract. The black cherries should be pitted before using them, if you are using fresh. The peaches should be peeled to remove their fuzzy skins (I use a vegetable peeler on peaches that are still slightly firm) and pitted, then cut into even slices (10-12 per peach). You can also use frozen cherries and peach slices for this cobbler if you have some stocked in your freezer. The rich flavors of the peaches and cherries blend very well together and give the cobbler a beautiful color and a lot of intense flavor. The cobbler is made with a very moist, biscuit-like dough that is dolloped onto the fruit before baking to created a “cobbled together” look for the finished dessert. It is buttery, thanks to both buttermilk and butter in its batter, but it isn’t too rich and adds just the right amount of texture to the fruit below. I like to sprinkle my cobbler with some coarse sugar just before baking to ensure that it has a nice crispy top, but cinnamon sugar might be a nice addition, too. The cobbler is very good both warm (just after baking) and cold (if you find your have leftovers). I like it best when it has been out of the oven for about 20-30 minutes and is still slightly warm, then served plain or with vanilla ice cream. Leftovers can be stored, covered, in the refrigerator for 1-2 days after baking and make a very nice alternative to cereal for breakfast. Combine cherries, peaches, brown sugar, cornstarch, salt and vanilla in a large bowl. Toss well and set aside. In a medium bowl, combine flour, sugar, salt, baking powder, buttermilk and melted butter and whisk to combine. Pour fruit into a 9Ã—9-inch square baking dish or a deep 9-inch pie plate. Dollop batter, which should be like a thick cake batter, over most of the fruit. Batter will spread during baking. Bake for 50-60 minutes, until topping is golden brown and filling is thick and bubbling. Frozen fruit in the filling may extend the baking time for an additional 5-10 minutes. Cool for at least 15 minutes before serving. 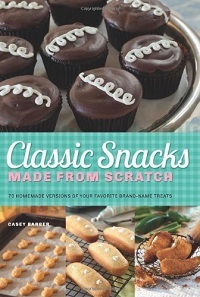 That looks so delish! 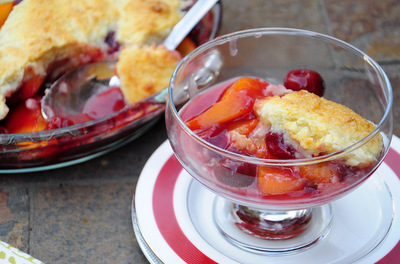 There is nothing better than peach cobbler so the cherry addition sounds perfect. Yum! This sounds fantastic. I can’t wait to try it. I love anything with peaches and/or cherries! Thanks for sharing. An excellent idea! I haven’t thought of mixing different fruit cobblers together. This is very delicious!